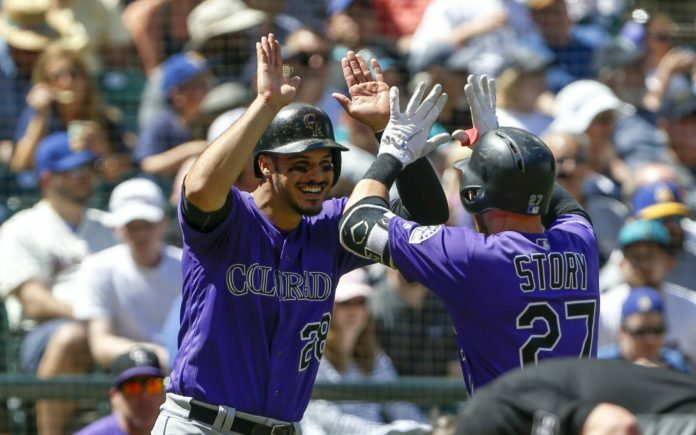 Nolan Arenado and Trevor Story celebrate Story's home run during Sunday's game. Credit: Jennifer Buchanan, USA TODAY Sports. 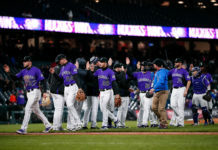 The Colorado Rockies will have three representatives in this year’s All-Star Game in Washington D.C. Nolan Arenado earned his second consecutive start while Trevor Story and Charlie Blackmon were selected as reserves, the MLB announced Sunday night. Arenado ranks near the top of the NL in most batting categories, including first in home runs (22), second in RBIs (63) and ninth in batting average (.309). He also leads all NL third basemen with 64 putouts and 181 assists in the field, and is in contention for his sixth consecutive Gold Glove. This is his fourth consecutive appearance on the NL roster. Story earned his first All-Star designation this season with impressive offensive numbers. The third-year player leads all NL shortstops with 17 home runs and 62 RBIs. He also places third among the position with a .282 batting average, second with a .522 slugging percentage and he’s third with 11 stolen bases. 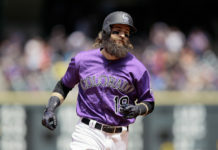 After earning the starting spot in center field last year, Blackmon was selected as a reserve in 2018. Despite having a down year from last year’s record-setting campaign, Blackmon ranks third among NL outfielders in home runs (17) and 10th in RBIs (40). Blackmon has found his grove thus far in July, hitting .333 with three home runs and five RBIs in seven games. Meanwhile, Adam Ottavino and Kyle Freeland were both snubbed from the roster. Ottavino is a deadly set-up pitcher out of Colorado’s bullpen and said after the selection show, “I’m not surprised. It’s because I’m on the Rockies. 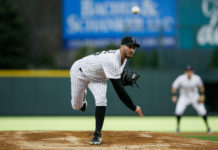 Pitchers don’t get any credit for pitching on the Rockies.” Per Nick Groke. Manager Bud Black will help manage the NL roster in this year’s Midsummer Classic. The 2018 MLB All-Star Game will take place Tuesday, July 17 at 6 p.m. MT at Nationals Park in Washington D.C.